These two pieces of writing were written during the Berlin Midnight Run by two of the participants. there was no infinite truth for me to gain from our past. searching in our souls and the shiny sparks. with tear-shimmering glances just a glimmer, not a lantern in this gloom. rather physical reflex than psychological reaction. and left nothing inside my core but jaded rubble on the shore. Your inner light shines brighter than the sun's rays. and the reliability of electric light. sometimes it flashes like lightning. burns me, so that I can only touch the after glow. and when your light fades, so will life's colours. And the world will only be darkness and blackness for me. It was just after the match, I could feel the lightning coursing through all the veins in my body. I was glowing. I could feel it radiating out of me, like an aurora. I made my way out of the stadium to take in what was left of the natural light, before midnight came. The rays of the sun were still visible on the horizon, but dim. I suddenly noticed a small flame ignite in the distance, just on the hill near the Hollywood sign. I ventured towards it without fear, a smart choice I thought to myself, as I climbed the uneven terrain of the slope. My inner confidence from the game was driving me continuously forward, I just couldn't help my intrigue. I knew it was dangerous, stupid probably too. I definitely needed a lamp or a lantern or something by the time I reached the big D, the darkness was growing heavier and thicker my the minute. It was just an old man warming himself beside a hand-made fire, alone, with his even more lonely brown-bag of alcohol. I sat with him and watched the stars and colourful lights pass through the deep night sky, the contrast was overwhelmingly beautiful. He told me they were Borealis. THE SOUL IN THE MACHINE - Inua Ellams. Sometimes I stare at my iPhone light and wonder if in another world, the pale plastic sheen of it is the inner glow of machines soul; if the glow of my reading light is the spirit of power plant. Lightning might be the leftover of celestial clashing, Aurora Borealis a galaxy's last gasp. Perhaps the moon is God's infant soul and the full spectrum creation, all grown-up. We’ve all seen the tourist spots, the photographs displaying the wealth of the capital, Boris’ propaganda trail about the beauty and power of the UK’s largest city. What often goes unchartered is the decline that goes with the power shift from industry to offices, the marks of poverty and dereliction as swathes of buildings fall into disuse. Into this void steps Paul Talling, former music promoter and the creator of Derelict London, a photography project based around London’s largely undocumented underside. Despite its success, resulting in two books and a TV series, Derelict London had humble origins and as Talling explains, “It was never a conscious project”. It all started back in 2003 on the way back to Richmond from London Bridge when he decided to walk rather than get a cab: “I thought ‘oh I wish I had my camera with me’ so after that that’s what I did”. After a move to Canning Town and the decision to put the images online the local and national press quickly picked up the story and thus one of the first urban exploration websites was born. Its uncontrived origins appear to make the project more resonant; it’s a straightforward concept carried out by an amateur photographer providing it with a greater sense of relatability. Talling is not trying to make any particular point about dereliction or regeneration, rather the images and stories that go with them are important in themselves. Although overtly the buildings may seem to be the focus, in reality it is the people who lived and worked in them. Not long after the publication of Talling’s second book, London’s Lost Rivers, he began conducting tours around various locations explored in his books; these became so popular that the current tours around Silvertown are sold out until September. As well as public tours, Talling does private events for colleges and company team bonding days. He explains that “even the regeneration people around [Silvertown] I’m doing some walks with, which has a different sort of slant to the area”. These tours are not mere nostalgia for ‘the golden age’ of British Industry, if anything Talling suggests that “we romanticise about some of these areas, it was pretty rough and ready round here and just a dustbowl. There’s all these old industrial areas that are left but it’s not beautiful or anything, it’s just very dusty and obviously all the firms are just moving out now”. Descriptions of the kinds of factories that occupied the Silvertown area suggest a near constant stench of chemical and animal product fumes, meanwhile the workers’ social conditions were hardly desirable. Although we may mourn the idea of the old working class pubs in the area that played host to front-runners of London’s punk scene, many of the stories included about them in the Derelict London books and tours involve murderous bar fights and gun violence. London’s cityscape has changed a lot in the last twelve years, to the extent that many of the places photographed in the early days of Derelict London have been either demolished or developed. Talling began taking tours around Limehouse only in 2013 but it is already so radically different that the same people are returning to view the changes. He is beginning to travel outside of the M25 to find new images, with recent visits to Epping and The Hoo Peninsula perhaps reflecting the overall trend of Londoners’ migration outwards as the negative effects of regeneration, such as rent increases, take hold. Dereliction acts as a signifier of societal change, for better or worse, and Paul Talling’s documentation of it offers a fascinating insight into social past and present. It’s a labour of love and twelve years later he is clearly as interested as ever. Put simply he says,” If I ever stop enjoying it then I’ll stop doing it”. Water: A release of tension. Envy: A single-wheeled form of transportation favoured by hipsters. A Tent: A sense of pleasure in oneself or something connected to an identity. Skin: To be deeply disturbed – like “against the machine”. Relief: A small, active, predatory mammal of the genus mustela erminea. Cobble: Cold, frozen, unable to feel. Curiosity: Something found on the beach, a smooth, fairly small object. Brick: Emotion you feel when someone jumps the queue. Sadness: A movement of air from the lungs outwards. Badger: A detachment, disengagement, a lack of inspiration. Serenity: A layer in the earth. An extrusion. Often of violent origin. Elephant: Deep sorrow, lack of hope. Solidarity: Olfactory organ for smelling. Foam: Feeling very depressed and low – usually for a specific reason. Censorship: A metal box that flies around at fairgrounds. Unicycle: Quiet fools sail away on this. Consternation: Worn on the foot to protect and keep dry. Yellow Door: Standing with your fellow people to show support in their struggles. Idleness: A blue liquid. Some use it for washing, some for drinking. Carbon Monoxide: A state of peacefulness. Rustication: The body’s reaction to a story about lemons. Despair: A smooth object used in hard landscaping. Indignation: A gaggle of bubbles. Lamp Post: Horror that shows on a face. Rage: Made from cat gut and creates a sound when plucked or bowed. Carrot: Emotion expressed in aggression or in a violent way. Loyalty: A rectangular block of clay, used to build. Breath: A philosophical position. A capacity to look with equanimity on life’s ups and down. Boredom: A hard, jagged, heavy object. Pebble: A feeling of alarm and bewilderment. Might be abbreviated to WTF. Peace: A shy, black and white animal. Lenor: A mutual feeling of inclination between people who enjoy each other’s company. Architecture is a reflection of a certain period, a particular cultural epoch. London has a particularly rich architectural history, not characterized by any one style it is a patchwork of many. Within this, there are a number that standout – characterized by intricate histories – many of which are or have been under threat of being lost forever. Here are a few that have survived by the will of their communities or by conversion: into buildings that serve a purpose in this ever evolving city. The Royal Vauxhall Tavern, Vauxhall. uilt in 1863 as a Victorian music hall it is now renowned as one of the oldest LGBTQ bars in London. It plays an important role to a vibrant London community and has hosted notable personages, such as the late Princess Diana (who reputedly visited in the 1980s in the company of Freddy Mercury, dressed as a man). Yet, uncertainty now hangs over its future. A petition to have it listed by English Heritage has been launched – and we can only hope that this keeps it a London fixture. Walking down Kilburn High Road, you cannot miss this grade II listed Art Deco theatre, once the renowned Gaumont State Cinema. Designed by Georges Coles, it opened in 1937 and was, for ten years, the largest auditorium in Europe, with a seating capacity of 4,004. While open it held performances by big names such as Marilyn Monroe, Frank Sinatra, The Beatles and The Rolling Stones. But by the late 1980s it had become a Mecca Bingo and remained a bingo hall until 2007. Its future is now held in the hands of Brixton based Ruach Ministeries. The Roundhouse Camden, also a grade II listed building, was saved by its capacity as a venue for performing arts. Now recognised as a popular London music venue, it was built in 1847 as a roundhouse to accommodate a railway turntable. Repurposed after ten years as a storage unit it was abandoned just before the outbreak of World War II. In 1964 it was redeemed by playwright Arnold Wesker and Centre 42 Theatre Company as a performing arts venue, but closed once more in 1983 due to lack of funding. Empty again it wasn’t until 1996 a business man purchased and restored it as a performing arts venue. And the Roundhouse lives on! One of the finest examples if art deco architecture in London, the former factory of the Hoover Company, designed in 1931 by Wallis, Gilbert & Partner was left unused and unloved for ten years after manufacturing ceased in 1982. 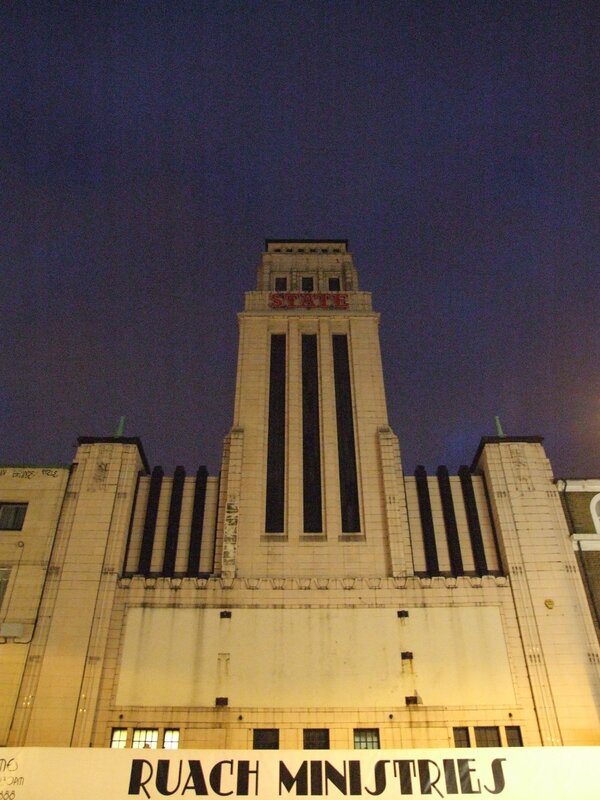 However, it seems it isn’t just our pockets that Tesco is saving, and this fantastic Art Deco building must now be one of the brand’s most remarkable superstores. The Sister Power Stations, Battersea and Southwark. Both designed by Sir Giles Gilbert Scott Battersea Power Station (1930s) and The Bankside Power Station (1947 – 63) are epic examples of industrial architecture – and both might have been demolished if not repurposed. After standing idle from 1981, work started in 1995 on the Bankside Power Station and it is now the home of Contemporary Art here in London - Tate Modern, its cavernous halls the ideal setting for art and installations. Battersea Power Station, decommissioned in 1983, is now being overhauled to become a dynamic living hub – arguably a city within power station, accommodating everything from offices and retail to residential areas and rooftop gardens. This Whole Sale Meat Market comes alive by night. It is the only market of its kind located on its original site within the Square Mile. The East and West market buildings were completed in 1868 but livestock and meat having been traded at this location for over 1000 years. In July 2014 its future was made certain with the announcement of its restoration and reuse, after the announcement of its demolition in 2013. Founded in 1845, the German Hospital offered treatment to German-speaking immigrants, regardless of origin or creed (although many out-patients were the English-speaking poor). Its history extends further, as was initially converted from the Dalston Infant Orphan Asylum. Going through many changes in its life, in 1940 its German staff were interned on The Isle of Wight as enemy aliens, and in 1948 it became part of the NHS before closure in 1987, it is now in residential use.